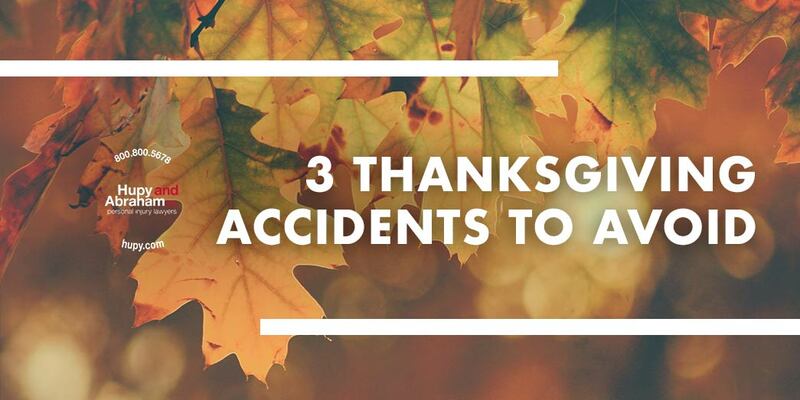 Three Thanksgiving Accidents You Need to Avoid | Hupy and Abraham, S.C.
For most Americans, the Thanksgiving holiday is a time for relaxation, good company and being thankful for all the positive things in our lives. But, when so many people are on the road or crowding into the kitchen on the same day, accidents are bound to happen. What’s important is that common-sense precautions are taken so that no one is hurt as a result of someone’s lapse in judgment. To ensure safety during the holiday, we must simply be mindful of the risks. The following are some of the accidents that often occur over Thanksgiving weekend. Injuries in the kitchen: Don’t go too far out of your comfort zone when preparing your Thanksgiving meal – or at least ask for some assistance! The last thing you want is to end up in the ER with a cut from a sharp kitchen knife or a burn from the stove. Make sure you’re also mindful of food temperatures so that no one becomes sick, and always clean as you go to avoid accidental slips and trips. And please, be careful if you deep-fry your turkey. Accidents on the road: Not only do you need to be on the lookout for potentially intoxicated drivers on the road, you should also be mindful if driving somewhere unfamiliar. Make sure your vehicle has a well-stocked emergency kit in case of a breakdown, and if you become lost, it’s important to pull over before making a phone call or consulting a map for directions. Rough relations: It’s common for people to not only watch football on Thanksgiving but also to play games, like football, with family and friends. Just be sure to keep your games light and fun. Last year, NPR reported that the ER sees almost 1,000 football-related injuries each Thanksgiving! On that note, it’s also not uncommon for alcohol to be a big part of the festivities. Families do not always get along, particularly when too many alcoholic beverages have been consumed. So, if you’re hosting, try to make sure everyone keeps their head and avoids disagreements that may escalate into physical confrontations. Thanksgiving is one of the most widely celebrated holidays in the United States. But it is also a time when many people are seriously injured in accidents, often due to the negligent or reckless behavior of another. Please be especially cautious if you start your Black Friday shopping on Thanksgiving evening, several types of accidents are common during this time. Keeping these tips in mind, all of us at Hupy and Abraham wish you and your family a safe and fun Thanksgiving. But if for any reason you experience an accident this Thanksgiving due to the negligent actions of a driver or property owner, we are here to help. Contact us online or call us directly at 800-800-5678 .